So much for Mutual Fund Monday, folks. Although that *was* the norm for weeks on end, it is no longer a guarantee for the longs. It has been hit or miss now since the end of January on that trading cliche if you go back and review. So.. we're in a tight range instead today post OPEX, with some sectors flirting with support while others are playing kissy face with resistance. 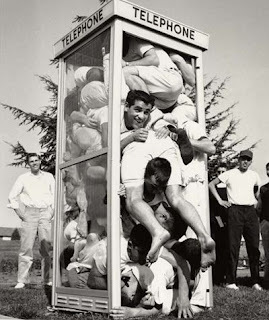 Either way, it feels like something will pop as you can only stuff just so much energy into a phone booth before there's just no more room to go but one direction or the other. On the other hand, sector rotation should be monitored carefully for clues, because they can certainly keep the plates spinning by just moving the game pieces around and around on the board. Earnings after the bell include: BRCD, MELI, JWN and HMA. Tomorrow will include: HD, SHLD, M, TGT, SAFM and VNO. On the economic calendar tomorrow: Redbook and S&P Case-Shiller HPI before the bell, Consumer Confidence and the State Street Investor Confidence numbers at 10:00 AM, 4wk and 2 yr auctions at 11:30 and 1:00 respectively, and James Bulltard will speak at 5:00 PM. Our friend, Benny, will not only be speaking today, but also on Wednesday and Thursday. Ode to Joy! Regardless, we’re going to have a very good and profitable week, and that’s an order! :-) Good luck to us all while we navigate together. In Hawaii, they have a saying… Hang Loose.. it’ll come to us. An ode to our fellow trader Big Island, while he enjoys life on the Big Island..
and some of us are still waiting for winter to go away….. I'm reading: Tight Range $$Tweet this!